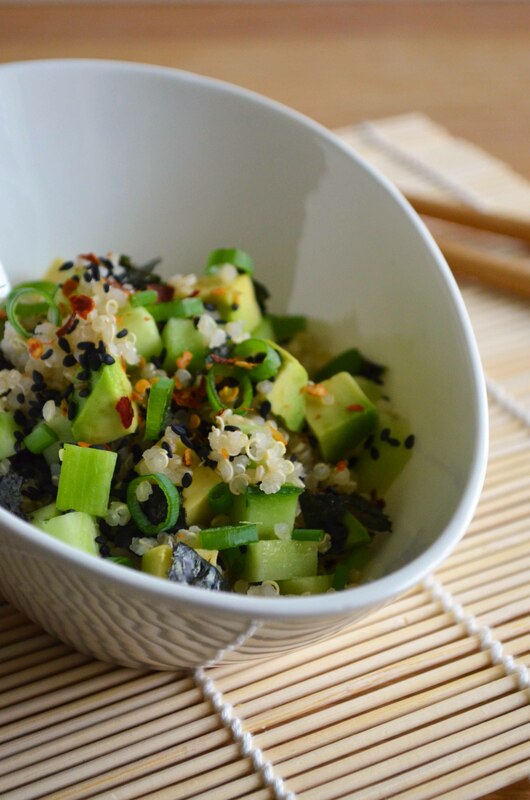 After I made my quinoa sushi, I still had some avocado, cucumber and spring onions left. I really hate throwing food away that is still perfectly fine to eat, so I decided to make a sushi bowl (as I was too lazy to actually make some more sushi haha). 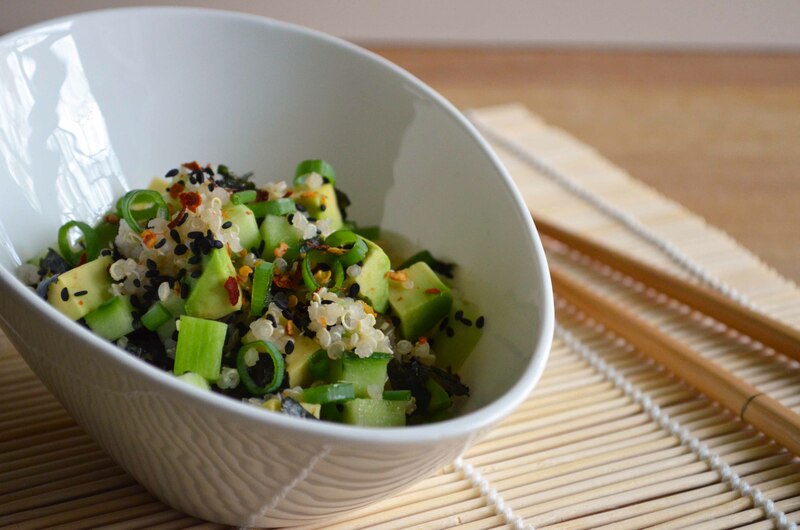 In this version I basically used the same ingredients as for my quinoa sushi, but of course you are not limited to these ingredients. If you still have some left over carrots, bell peppers or other vegetables, feel free to just add them to the mix. Unfortunately I didn’t have any edamame (young soy beans) at hand, but I am sure those would really make a great addition to this sushi bowl! 1. Cook the quinoa following the instructions on the package. After cooking, drain it from its water and set aside to cool off a little. 2. Meanwhile, cut up the cucumber and avocado in small 0,5 by 0,5 cm cubes. 3. Cut the spring onion in small rings. Keep the white root part, if you put them in some water you can regrow them! 4. Juice the lime, and sprinkle half of the lime juice over the cooked quinoa. Mix well. You won’t need the rest of the lime juice, but you can e.g. use it for some lime water, or this smoothie! 5. Cut up the nori sheet in small squares. 6. 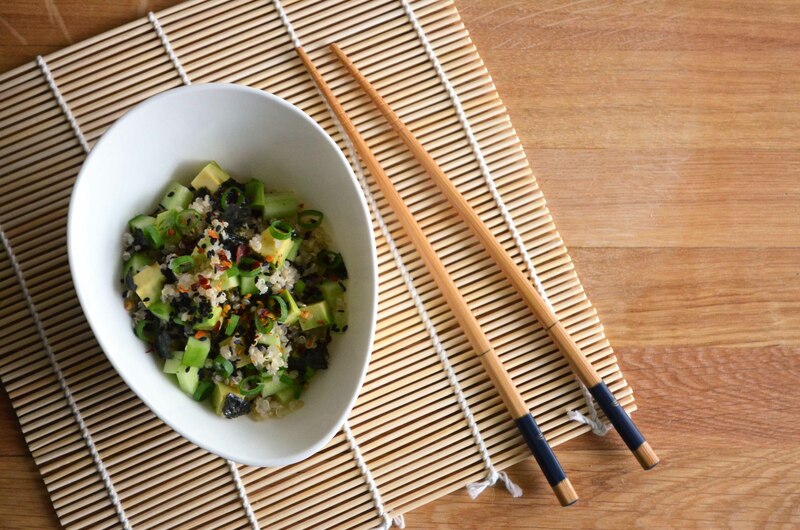 Distribute the cucumber, avocado, spring onions, the nori squares, black sesame seeds and chili flakes over the quinoa. Mix everything well, and enjoy! If you really miss some saltiness, you can of course add a little soy sauce or tamari (gluten free soy sauce), to spice it up a little. However, I would not recommend it, as salt can have some very negative health effects, when consumed too much.